Includes: Comark C9551/SIL, tubing and connectors. 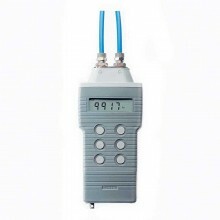 The Comark C95x1 Pressure Meters combines high accuracy with speed of response, and is designed to function between 0 to ±140mbar, with twin inputs for gauge or differential pressure measurement. With a durable design to survive an industrial setting, it is dust and waterproof to IP67 Standard (BS EN 60529). The Comark C9551/SIL (with Silicone protection for liquid pressure measurement), combines high accuracy with speed of response and has twin inputs for gauge or differential pressure measurement. Typical applications include boiler flue draft, air conditioning filters, laboratories and clean rooms, process pressures, service and maintenance and the calibration of other instruments. Selectable pressure units: PSI, mbar, inH2O, mmHg, torr, Pa, mmH2O. Silicone protection option for liquid pressure measurement. Over-range indication – maximum over/under pressure 6PSI/400mbar. ATEX compliant intrinsically safe models are certified to: ex II 1G Ex ia IIC T4 Ga, Baseefa03ATEX0079. Pressure Measurement Range 0 to ±140 mBar - 0 - 2 PSI (See manual for other ranges). *Non-IS Models Only. IS models must only use Zinc Chloride Battery. Comark C9551/SIL warranty 2 Years.